Home Nutrition Is the 16:8 Intermittent Fasting Method the best way to improve your health and body? We’re all looking for a good, definable way to take charge of our health — to feel better, to look better, to stave off illness and injury for a long, enjoyable life. Of course, the best thing to do is to pursue a multi-pronged approach to wellness. It’s not enough to be active; you have to eat well, too, and surround yourself with caring friends and family. Of course, lots of people promise that the key to wellness is in some particular habit. Some of them might be right, but many of them are not basing their opinions on anything scientific at all. But some of them, it turns out, might have the results and the basis in fact in order to support them. 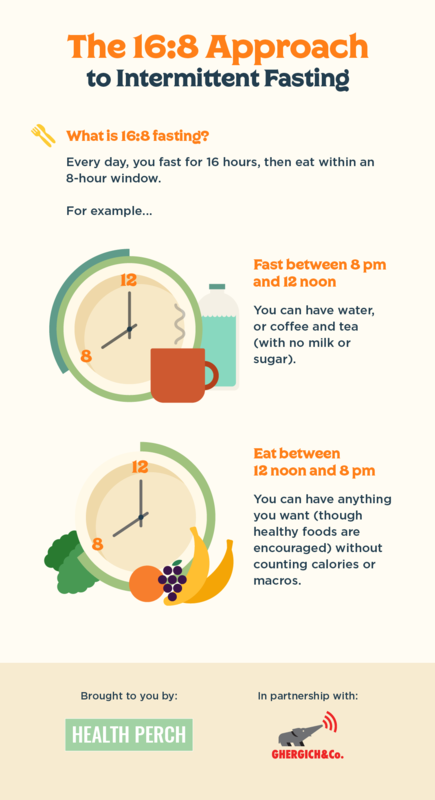 What’s the 16:8 Intermittent Fasting Method all about? That’s the case with what’s called intermittent fasting. What does it take to follow this program and how might it help your health? This graphic offers some insights. One of the most important factors behind the success and effectiveness of this approach is its ability to regulate the production of powerful hormones within the body, specifically insulin and insulin-like growth factor-1 (IGF-1). When these hormones and the feedback loops that govern their production operate optimally then an environment is created where we’re better able to reduce stored body fat, often at a higher rate as we are better able to regulate blood sugar and our metabolism. Diet adherents are required to consume all their calories in an eight-hour period, seven days a week. This feeding window should generally be kept between the same times each day, normally from early afternoon to early evening. In doing so the body is required to tap into stored energy to fuel its daily activities each day. Some form of fasted exercise is promoted to help accelerate fat metabolism and improve insulin sensitivity. However, there are a few challenges to this approach. Firstly, it can be hard to abstain from eating for such long periods of time, at least initially. The other issue some people face is physically consuming all of their required calories in such a short timeframe. And if you don’t know exactly how much you should consume, then you may be under-eating or overeating. The former is a more likely scenario in most instances. It is, therefore, important to calculate your daily energy requirements, which should ideally be done with the help of a qualified professional.